Here we have the embryonic orchard (the tree closest to the camera is a Ribston Pippin), growing away well and looking gloriously healthy. But is it all too good to be true? 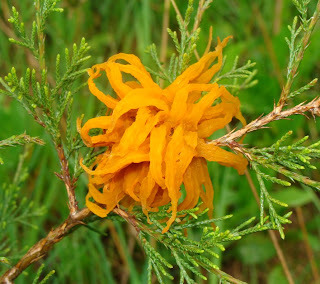 Just as in a horror film, there is danger lurking in the bushes: the interesting-looking structure below is a cedar-apple-rust gall with its 'telial horns', one of a number growing on a red cedar (Eastern Juniper) tree close to the orchard. The spores in these horns are released during wet spells (like today's) and will spread to apple trees in the vicinity. 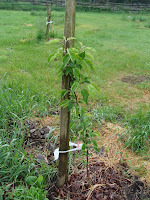 The affected apple trees will release their spores in late summer, ready to re-infect the cedars. I noticed the galls the other day and thought 'Aren't they pretty?'. Now I feel differently about them. Sometimes ignorance is preferable! So today's rain may be bad news for the apple trees, but at least the tadpoles have got their pond back. 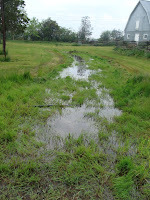 It was down to three large puddles on Friday. The weather is due to turn hot and dry after today, though, so they're still living on borrowed time. What can be done about this particular horror? That growth does indeed look very pretty. A little like carrot shavings bundled together. Hope your apples come through ok.